Induced pluripotent stem cells (iPSCs) and genome-editing techniques have facilitated manipulation of living organisms in innumerable ways at the cellular and genetic levels, respectively, and will underpin many aspects of regenerative medicine as it continues to evolve. An attitudinal change is also occurring. Experts in regenerative medicine have increasingly begun to embrace the view that comprehensively repairing the damage of aging is a practical and feasible goal. A notable proponent of this view is Aubrey de Grey, Ph.D., a biomedical gerontologist who has pioneered an regenerative medicine approach called Strategies for Engineered Negligible Senescence (SENS). He works to “develop, promote, and ensure widespread access to regenerative medicine solutions to the disabilities and diseases of aging” as CSO and co-founder of the SENS Research Foundation. He is also the editor-in-chief of Rejuvenation Research, published by Mary Ann Liebert. Dr. de Grey points out that stem cell treatments for age-related conditions such as Parkinson’s are already in clinical trials, and immune therapies to remove molecular waste products in the extracellular space, such as amyloid in Alzheimer’s, have succeeded in such trials. Recently, there has been progress in animal models in removing toxic cells that the body is failing to kill. The most encouraging work is in cancer immunotherapy, which is rapidly advancing after decades in the doldrums. Many damage-repair strategies are at an early stage of research. Although these strategies look promising, they are handicapped by a lack of funding. If that does not change soon, the scientific community is at risk of failing to capitalize on the relevant technological advances. Regenerative medicine has moved beyond boutique applications. In degenerative disease, cells lose their function or suffer elimination because they harbor genetic defects. iPSC therapies have the potential to be curative, replacing the defective cells and eliminating symptoms in their entirety. One of the biggest hurdles to commercialization of iPSC therapies is manufacturing. Minimally manipulated adult stem cells have progressed relatively quickly to the clinic. In this scenario, cells are taken out of the body, expanded unchanged, then reintroduced. More preclinical rigor applies to potential iPSC therapy. In this case, hematopoietic blood cells are used to make stem cells, which are manufactured into the cell type of interest before reintroduction. Preclinical tests must demonstrate that iPSC-derived cells perform as intended, are safe, and possess little or no off-target activity. For example, CDI developed a Parkinsonian model in which iPSC-derived dopaminergic neurons were introduced to primates. The model showed engraftment and enervation, and it appeared to be free of proliferative stem cells. “You will see iPSCs first used in clinical trials as a surrogate to understand efficacy and safety,” notes Mr. Parker. “In an ongoing drug-repurposing trial with GlaxoSmithKline and Harvard University, iPSC-derived motor neurons will be produced from patients with amyotrophic lateral sclerosis and tested in parallel with the drug.” CDI has three cell-therapy programs in their commercialization pipeline focusing on macular degeneration, Parkinson’s disease, and postmyocardial infarction. Cellular Dynamics International (CDI) has been developing clinically compatible induced pluripotent stem cells (iPSCs) and iPSC-derived human retinal pigment epithelial (RPE) cells. CDI’s MyCell Retinal Pigment Epithelial Cells are part of a possible therapy for macular degeneration. They can be grown on bioengineered, nanofibrous scaffolds, and then the RPE cell–enriched scaffolds can be transplanted into patients’ eyes. 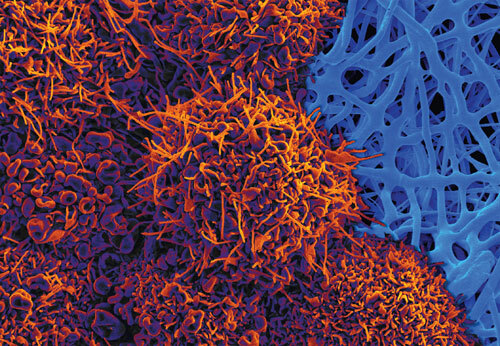 In this pseudo-colored image, RPE cells are shown growing over the nanofibers. Each cell has thousands of “tongue” and “rod” protrusions that could naturally support rod and cone cells in the eye. The eye has multiple advantages over other organ systems for regenerative medicine. Advanced surgical methods can access the back of the eye, noninvasive imaging methods can follow the transplanted cells, good outcome parameters exist, and relatively few cells are needed. These advantages have attracted many groups to tackle ocular disease, in particular age-related macular degeneration, the leading cause of blindness in the elderly in the United States. Most cases of age-related macular degeneration are thought to be due to the death or dysfunction of cells in the retinal pigment epithelium (RPE). RPE cells are crucial support cells for the rods, cones, and photoreceptors. When RPE cells stop working or die, the photoreceptors die and a vision deficit results. A regenerated and restored RPE might prevent the irreversible loss of photoreceptors, possibly via the the transplantation of functionally polarized RPE monolayers derived from human embryonic stem cells. This approach is being explored by the California Project to Cure Blindness, a collaborative effort involving the University of Southern California (USC), the University of California, Santa Barbara (UCSB), the California Institute of Technology, City of Hope, and Regenerative Patch Technologies. The project, which is funded by the California Institute of Regenerative Medicine (CIRM), started in 2010, and an IND was filed early 2015. Clinical trial recruitment has begun. One of the project’s leaders is Dennis Clegg, Ph.D., Wilcox Family Chair in BioMedicine, UCSB. His laboratory developed the protocol to turn undifferentiated H9 embryonic stem cells into a homogenous population of RPE cells. Moving therapies such as this RPE treatment from concept to clinic is a huge team effort and requires various kinds of expertise. Besides benefitting from Dr. Clegg’s contribution, the RPE project incorporates the work of Mark Humayun, M.D., Ph.D., co-director of the USC Eye Institute and director of the USC Institute for Biomedical Therapeutics and recipient of the National Medal of Technology and Innovation, and David Hinton, Ph.D., a researcher at USC who has studied how actvated RPE cells can alter the local retinal microenvironment. The California Project to Cure Blindness is evaluating a stem cell–based treatment strategy for age-related macular degeneration. The strategy involves growing retinal pigment epithelium (RPE) cells on a biostable, synthetic scaffold, then implanting the RPE cell–enriched scaffold to replace RPE cells that are dying or dysfunctional. One of the project’s directors, Dennis Clegg, Ph.D., a researcher at the University of California, Santa Barbara, provided this image, which shows stem cell–derived RPE cells. 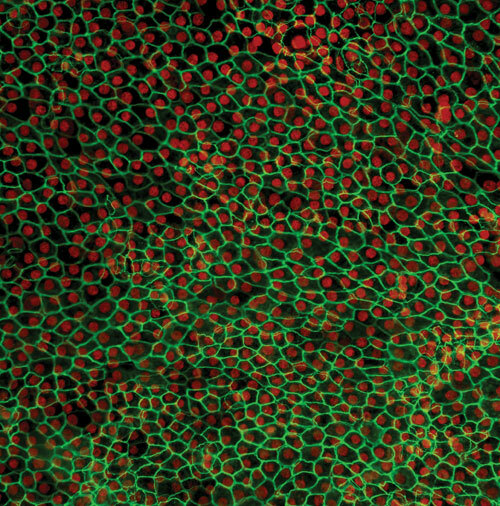 Cell borders are green, and nuclei are red. According to Charles Cox, Jr., M.D., director, Children’s Program in Regenerative Medicine, The University of Texas Health Sciences Center at Houston, the most important finding from his research on traumatic brain and spinal cord injury is that the mechanism of action of bone marrow–derived cells (adherent bone marrow–derived stromal cells, bone marrow mononuclear cells, and others) seems to be related to modulation of the innate immune response to injury. Dr. Cox leads a research group that has repeatedly shown that after an intravenous infusion of these cell types, there is polarization of the microglia, the end effector cells, toward a reparative phenotype instead of an inflammatory one. This is mediated through interactions of the infused cells with pulmonary and splenic immune cells, and other factors, that promote the release of cytokines. This is not engraftment and probably also not a true paracrine effect; it is important because these data influence the route of delivery. Specifically, craniotomy and injecting cells into the brain is an invasive procedure. Traumatic brain injury is a multifocal disease that is not amenable to local injection into numerous lesions. Depending upon cell migration throughout the adult brain is problematic. The biggest challenges for implementing these types of cellular therapies are scalability, potency assays, and cost. Scalability is being addressed in numerous venues; current manufacturing approaches are not feasible. In addition, many immunophenotype/cell surface markers used to identify cell types do not necessarily address potency. The Cox group has correlated in vitro potency assay matrices with in vivo readouts of efficacy in preclinical animal models. This work has advanced IND-enabling studies and the development of a new set of potency release criteria. Lastly, the cost of goods to develop certain cellular therapies can be daunting. Six- figure doses mandate a discussion of the value proposition of any therapy. Dr. Cox believes that combination therapies that use both an immune modulation strategy followed by an engraftment strategy will be the future. Red blood cells (RBCs) are being “functionalized for the treatment of autoimmune conditions, metabolic diseases, cancer, and other serious diseases. This approach is being explored by Rubius Therapeutics, a company that is using a development platform called Rubius Erythrocyte Design (RED) to engineer hematopoietic stem cells to express biotherapeutic proteins. Once the cells are engineered, they pass through defined culture steps and undergo differentiation and enucleation. Ultimately, RBCs are obtained that express the desired proteins either internally or on their surface. Rubius calls its approach Red-Cell Therapeutics (RCT) and says that RCT products can be rapidly prototyped in parallel to test different hypotheses. The culture and differentiation process is always the same. The inserted gene determines the function. Also, the RCT approach does not rely on autologous cells. It is, rather, an allogeneic technology. The allogeneic mode needn’t give rise to immunogenicity problems, as evidenced by roughly a century of consistently successful blood transfusions. The first clinical indication for RCTs will be enzyme replacement therapy to treat phenylketonuria (PKU), a disease attributed to the lack of an enzyme required to metabolize phenylalanine. Disease management is currently through strict dietary restriction. An infusion of RCTs that circulate for months, and continually metabolize circulating phenylalanine could alleviate dietary restrictions. Other applications of RCTs include adding surface antibodies for use as circulating inhibitors or capturing agents, and other surface modifications, such as adding agonists or targeting moieties, to specifically engage other cell types or tissues. RCTs also show promise for autoimmune disease. Animal systems have demonstrated a generalized phenomenon. When specific protein antigens are associated with the red cells, the red cells induce peripheral tolerance against that antigen. For decades, an urge to discern the secrets of unusually long-lived people has animated the work of Nir Barzilai, M.D., a researcher who is currently the director of the Institute for Aging Research at Albert Einstein College of Medicine. Soon after Dr. Barzilai joined Albert Einstein in 1993, he launched a study focused on a cohort of long-lived Ashkenazi Jews that included more than 600 of the “oldest old” ranging in age from 95 to 112. Since then, Dr. Barzilai has sustained his maintained his research of the elderly, and he has consistently collected data on the genetics, epigenetics, blood chemistry, and lifestyles of both centenarians and their children. For example, his analyses on centenarians have identified population variants in two genes associated with increased levels of high-density lipoprotein, a variant that downregulates insulin growth factor (IGF-1), and production of a high level of the mitochondrial peptide, humanin. Targeting Aging with MEtformin (TAME) is a specific study focused on the concept that multimorbidities of aging can be delayed by metformin, a commonly used drug for the prevention and treatment of type 2 diabetes. 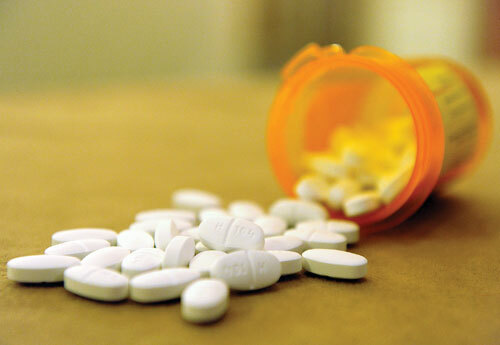 Studies have demonstrated a decreased risk of not only cardiovascular disease but also cancer risk and cancer mortality in type 2 diabetic individuals taking metformin. Metformin has also been associated with longevity in rodent models. The mechanisms proposed relate to its effects on reducing insulin levels, improving insulin action, decreasing IGF-1 signaling, and reducing the senescent process as well as activation of AMP-kinase. The TAME study hypothesis is that delaying aging is the only effective way to delay age-related diseases and compress morbidity. Sponsored by the American Federation for Aging Research, the study will recruit elderly subjects and, in a double-blind, placebo-control study, will test if metformin can put off the onset of multimorbidities including cancer, cardiovascular disease, type 2 diabetes, cognitive decline, and mortality. As the study’s principal investigator, Dr. Barzilai, hopes to convince the FDA to approve aging, as measured by multiple disease endpoints, as an indication. There is a great benefit for healthy lifespan, not only to the individual, but also for society in the form of cost savings, which is often referred to as the longevity dividend.